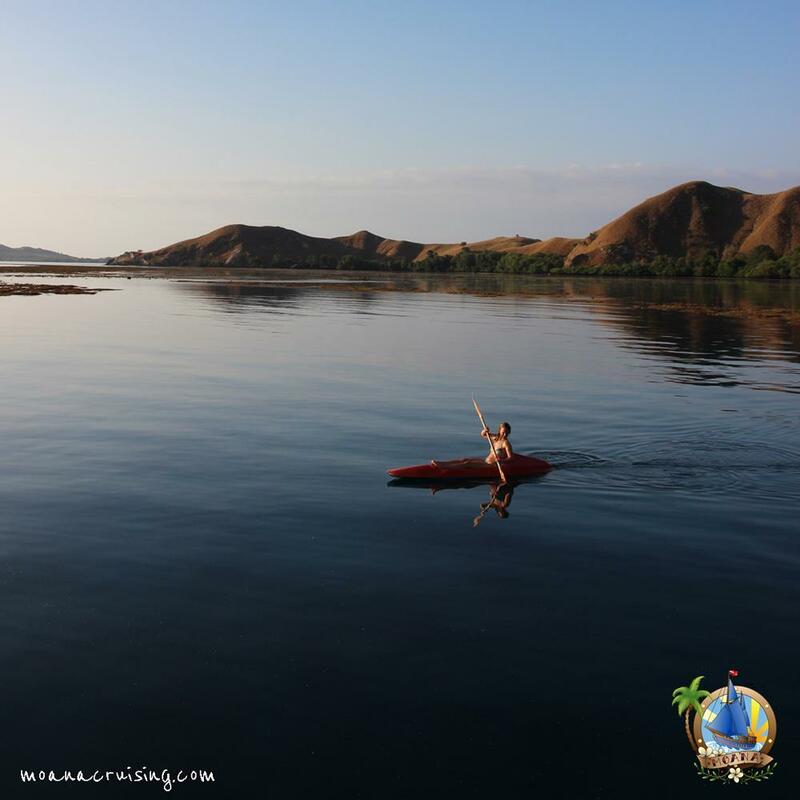 Moana is a very popular choice for divers who want to experience the best Komodo liveaboard experiences without being part of a large group or spending more money than necessary. 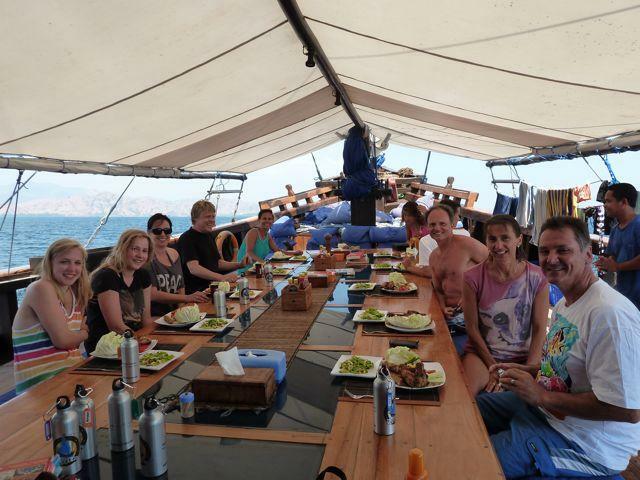 With no more than 10 diving guests on each trip, the diving cruises are friendly, fun & personal. 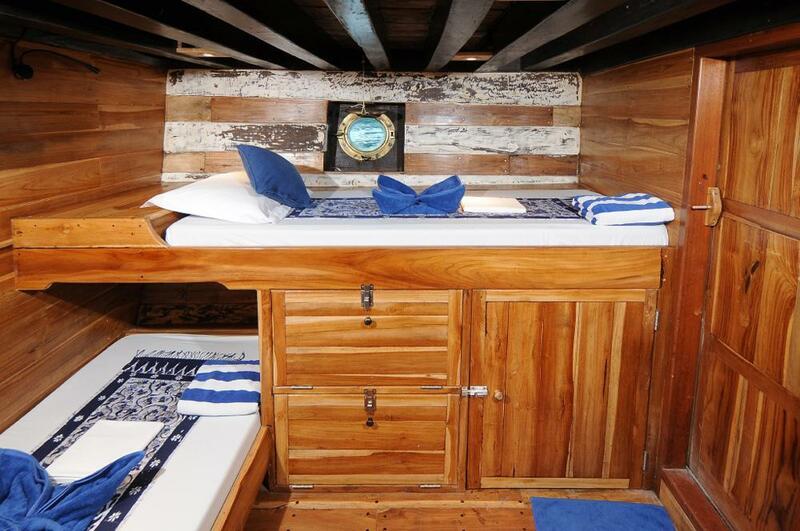 There is a range of cabins, and even children are welcome to join at discounted prices. 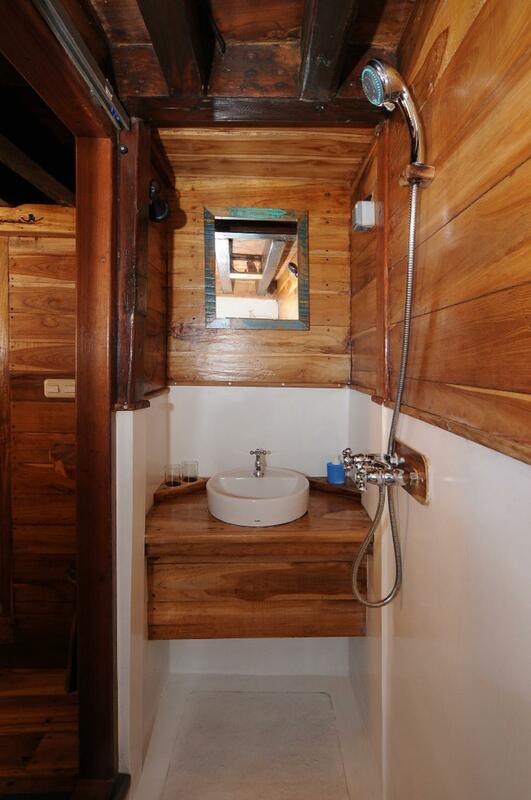 All the cabins are air conditioned and have private en suite bathrooms with western-style toilets. 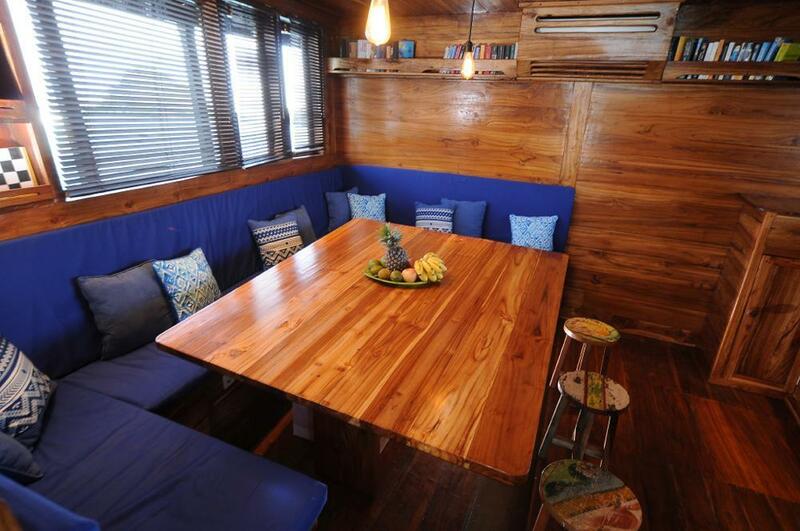 The capacity can be 12 guests, but limited to 10 divers in order to give everyone what they want and need. Most trips are limited to 10. 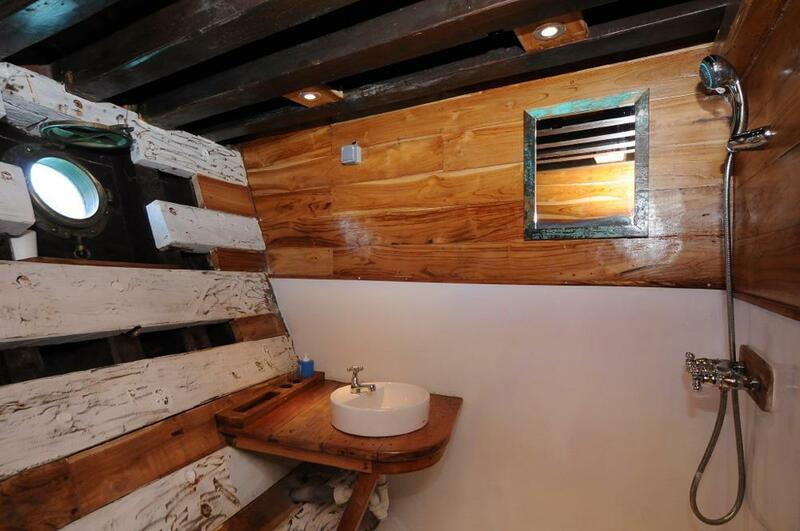 The boat has a very classic look and feel to it, with a ‘rustic design’ that is made using high-quality materials. 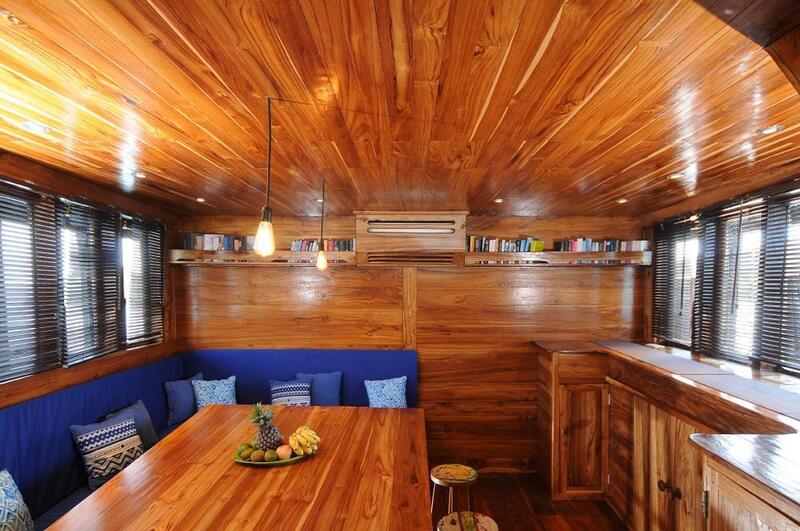 All the cabins are below the main deck, allowing more space for communal & social gatherings among the guests. 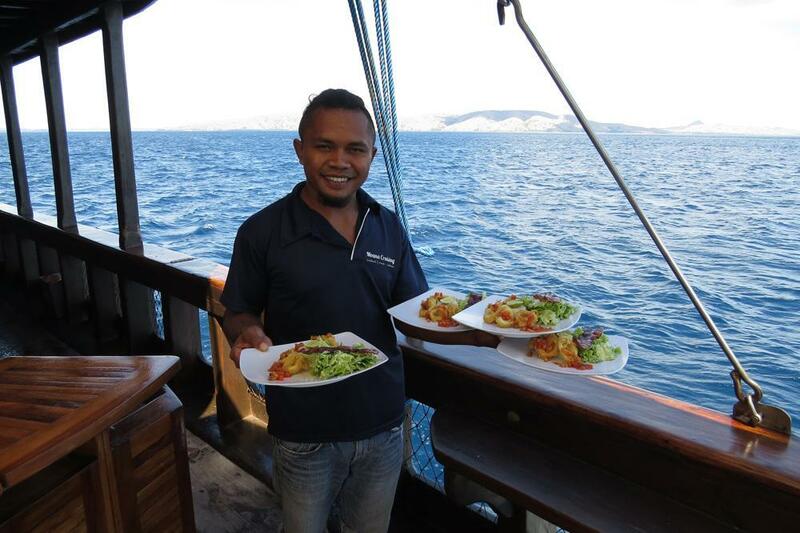 The crew and diving staff on Moana are all experienced in their particular duties, and have been sailing around Komodo for many years. 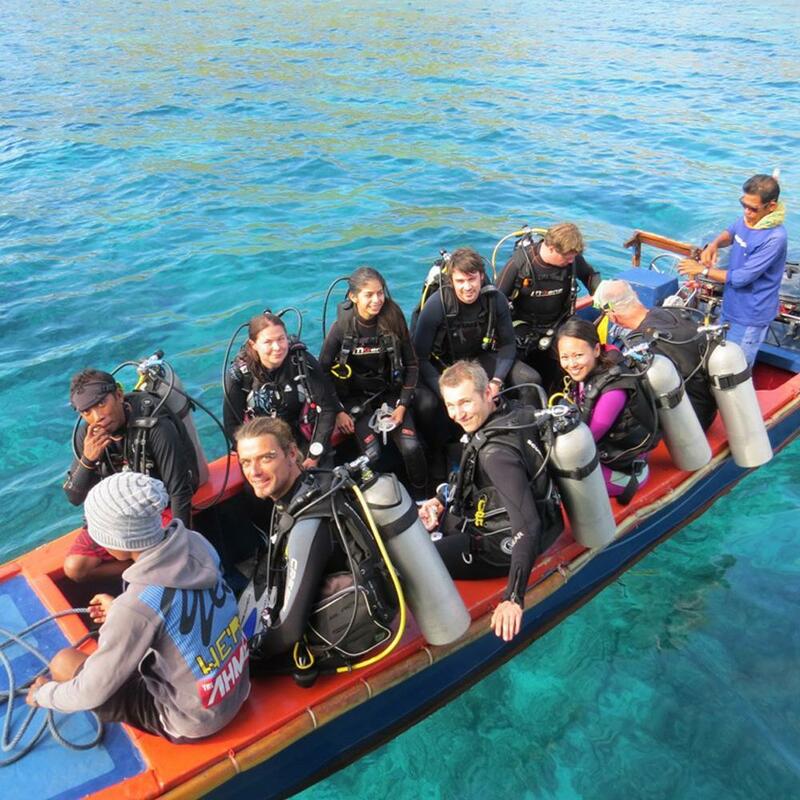 And with a limit of ten divers on any trip, the dives are always organized to best suit the ability and needs of the paying guests. 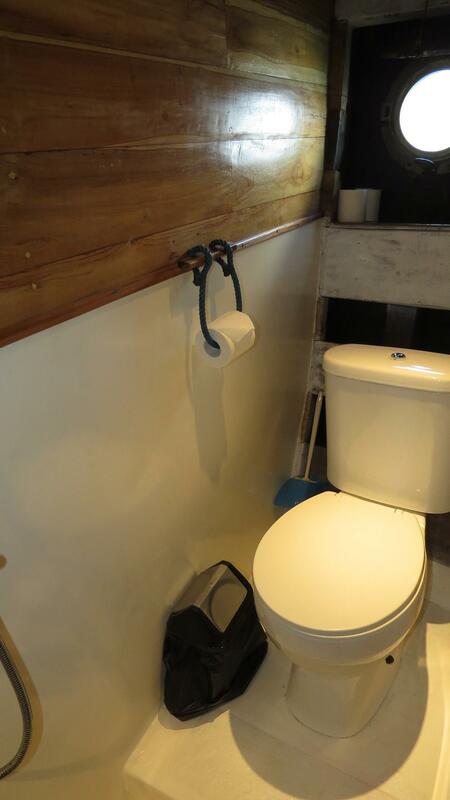 There are sea kayaks to use for free. The food is served all day long and is simply delicious. 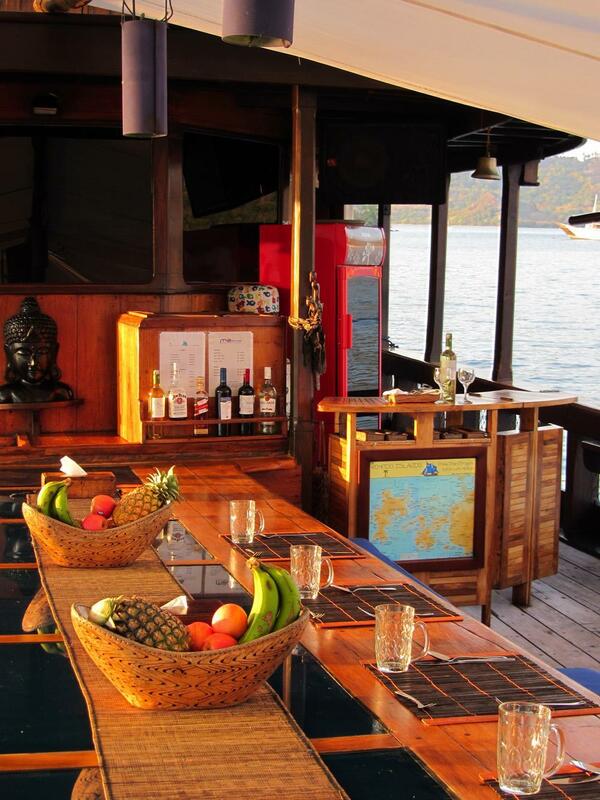 A good mix of local & western cuisine, with a vegetarian option at every meal. 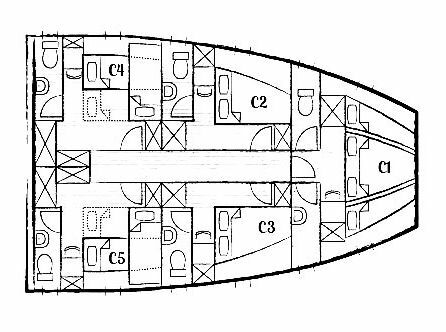 While most time aboard is spent enjoying the sea breeze socializing, reading books, sunbathing or looking out for dolphins, there is an air-conditioned saloon on the main deck, too. 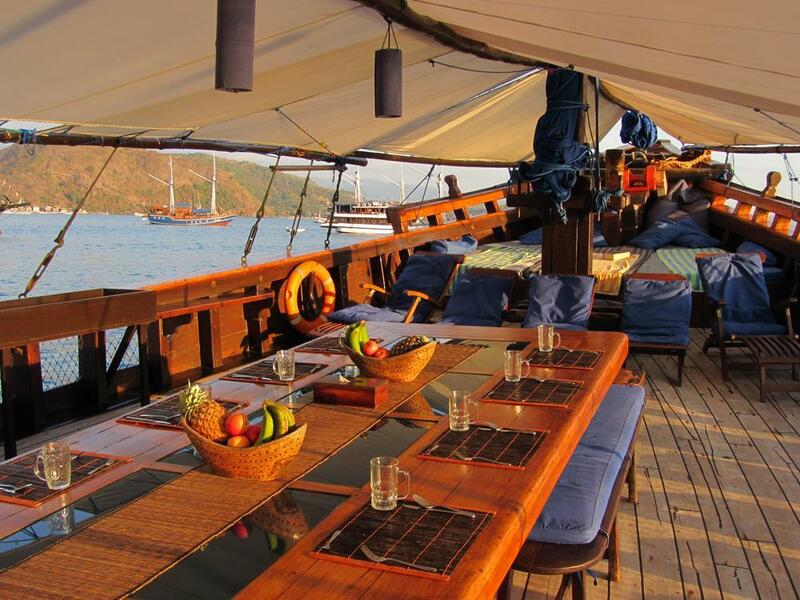 Trips are usually 5 or 6 days in length and each itinerary is modified to best suit the conditions at the time and the needs of those on board. 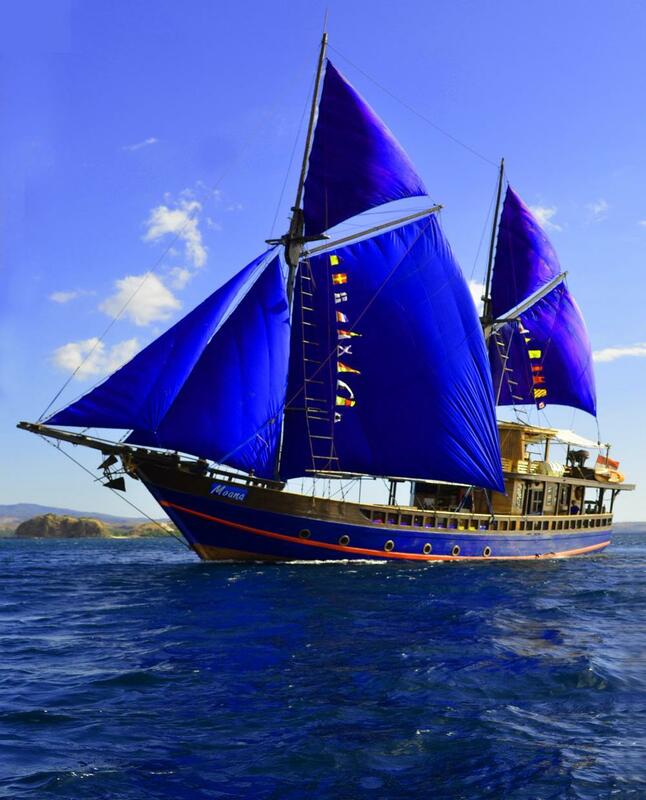 Although this Phinisi schooner has sails, which it uses, there is a Mitsubishi 8-cylinder engine to propel it through these waters. 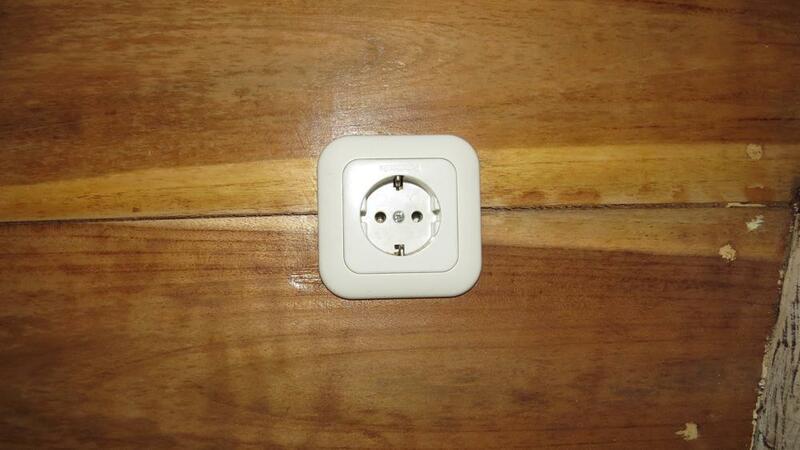 In addition, safety, communication & navigation features are all modern. 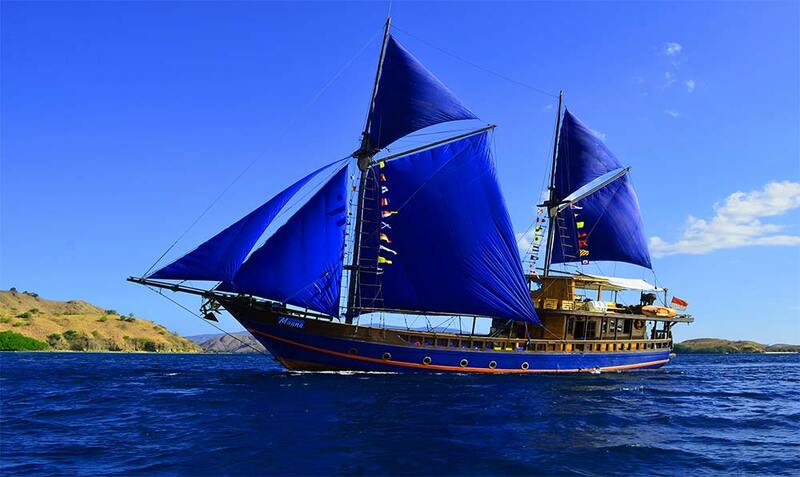 The boat just looks ‘classic’ but has up-to-date facilities and creature comforts to make your Komodo diving safari something to remember for the rest of your life. 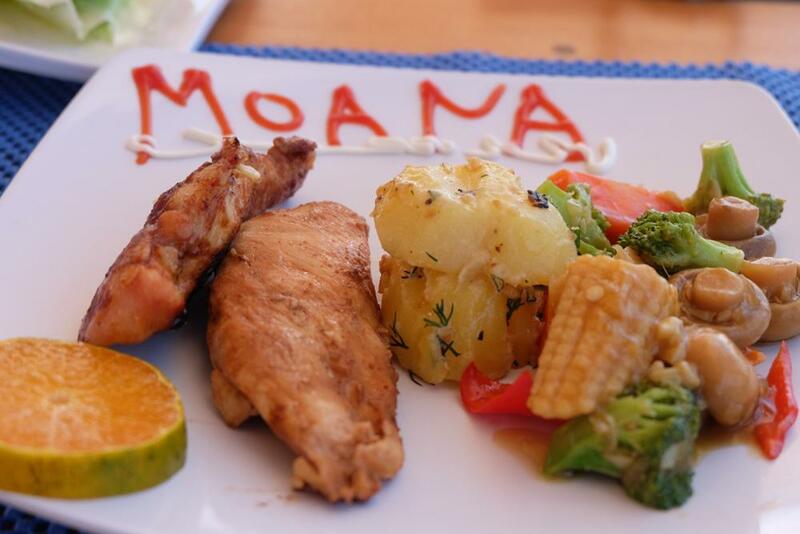 New for late 2016 and onwards, Moana guests can pre-book a special event, such as a romantic proposal, anniversary, birthday or honeymoon meal. This is 1.5 - 2 hours of the beach to yourselves (with a member of staff to serve and/or take photos) with a bottle of sparkling wine, the beach decorated appropriately, and in some cases a 3-course meal served and enjoyed on the beach. 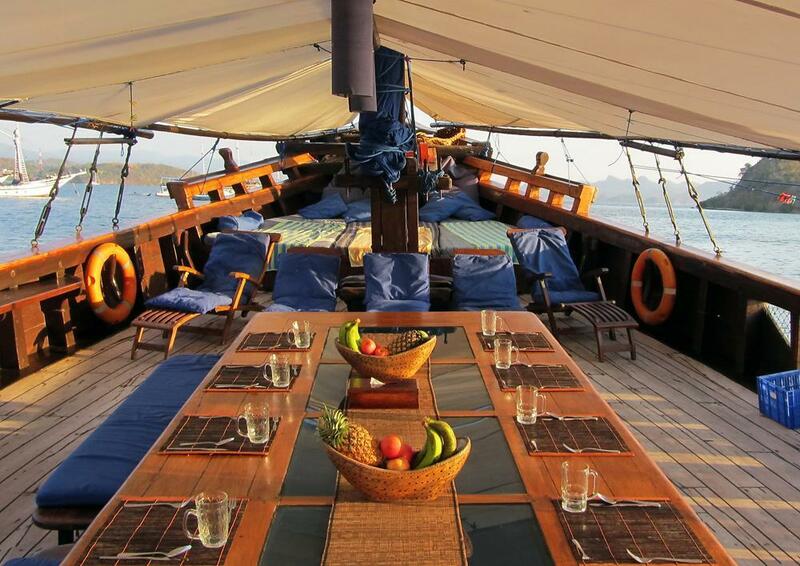 Most of Moana’s Komodo liveaboard diving cruises are 5 nights in length, but there are a few which are longer or shorter. 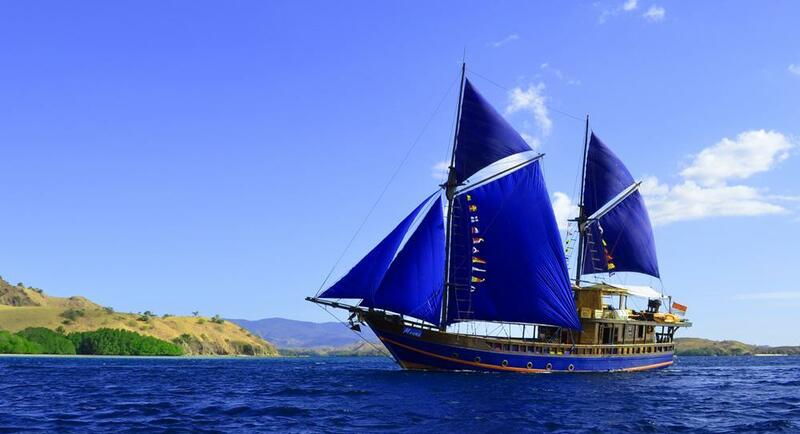 Nearly all start and finish at Labuan Bajo, on Flores. Please check the schedule carefully before booking your flights. 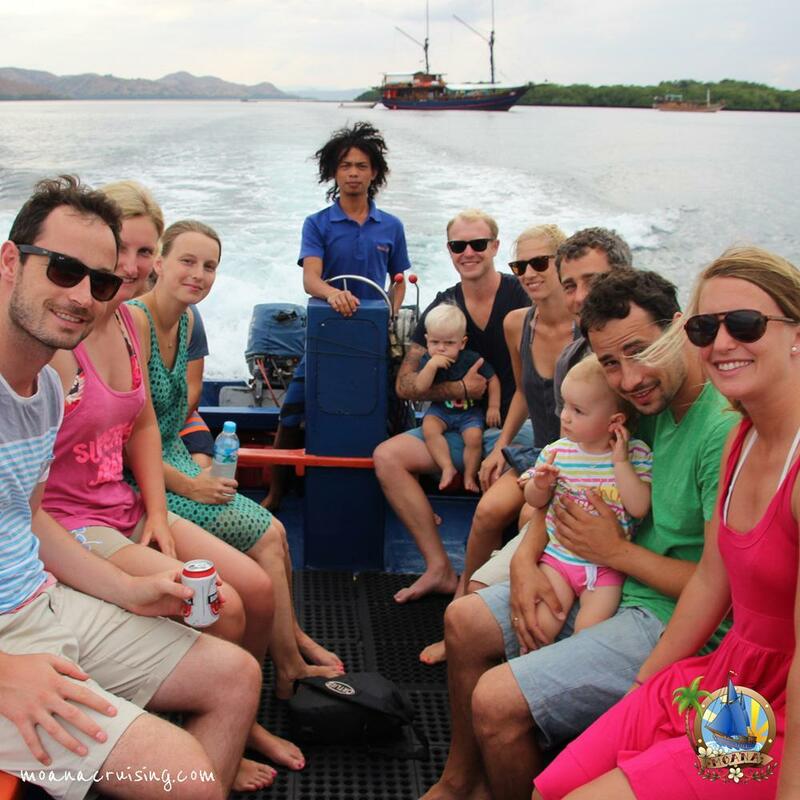 For trips which are longer or shorter than 5D/5N the first and final days will be the same as regular trips, and you will still get to visit the Komodo Dragons on Rinca Island. 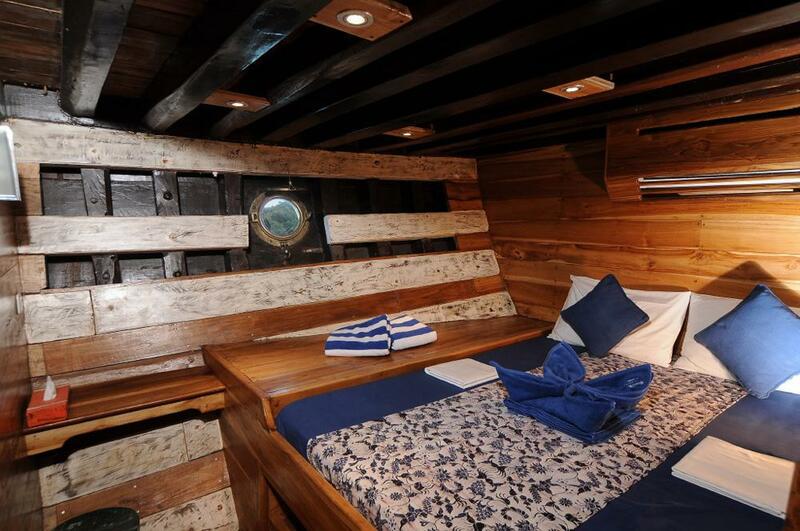 The cruise director will make sure that the best dive sites are visited for longer trips, or appropriate dive sites are skipped for shorter trips. 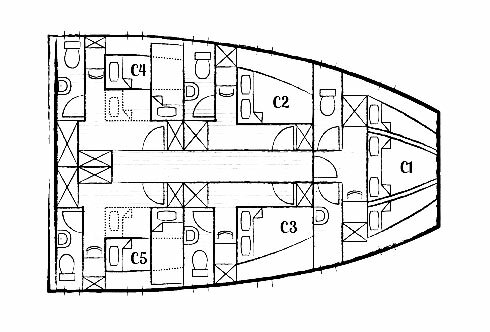 Sail Area: 270 Sq. 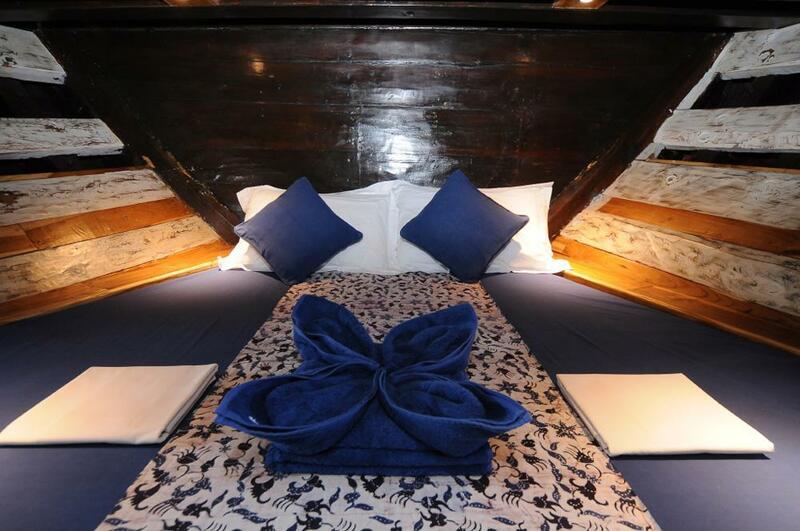 M.
There are free transfers from local hotels and the airport nearest to the departure pier. 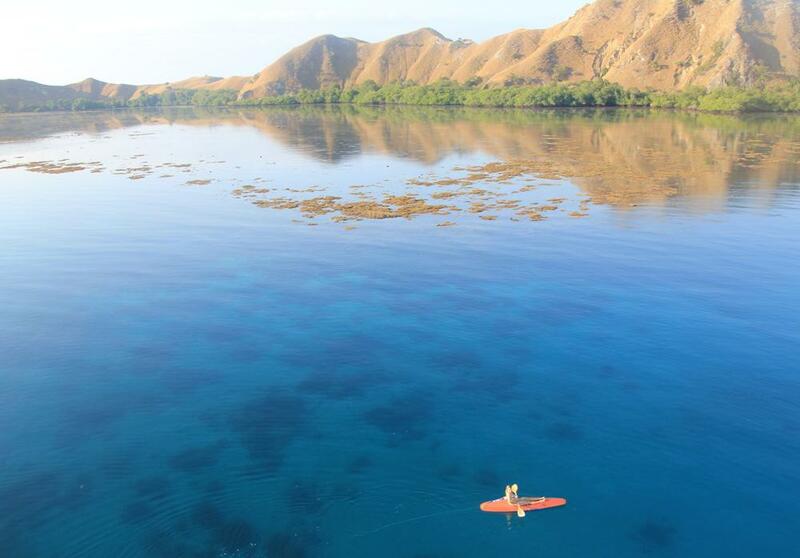 This is most commonly Labuan Bajo Airport, which is just 15-20 minutes from the boat. 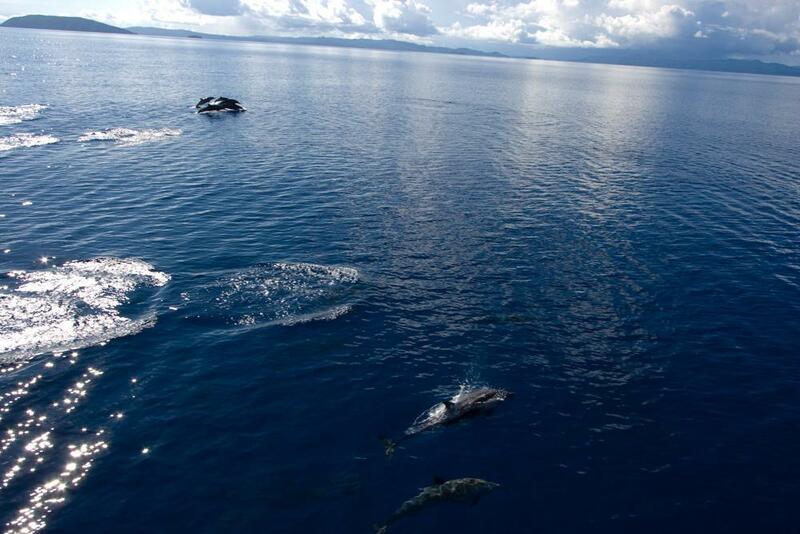 Most guests take the early morning flight from Bali. 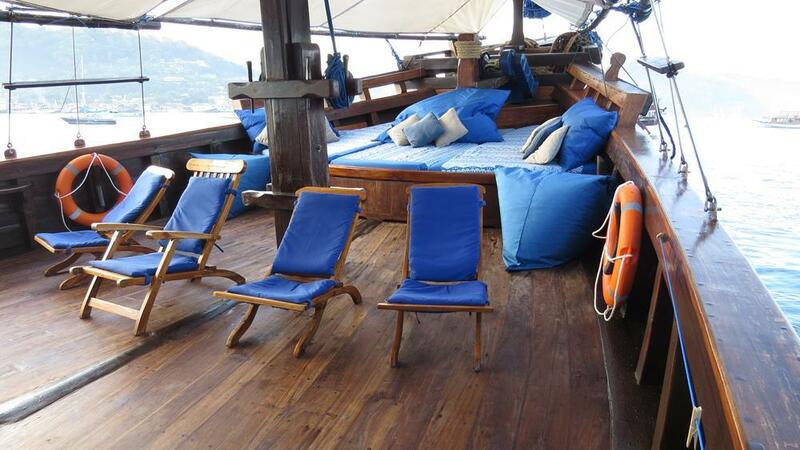 Ideally, all guests will be on the boat by 10.00am on the departure day. Rates are 'per person,' but children recieve a large discount. 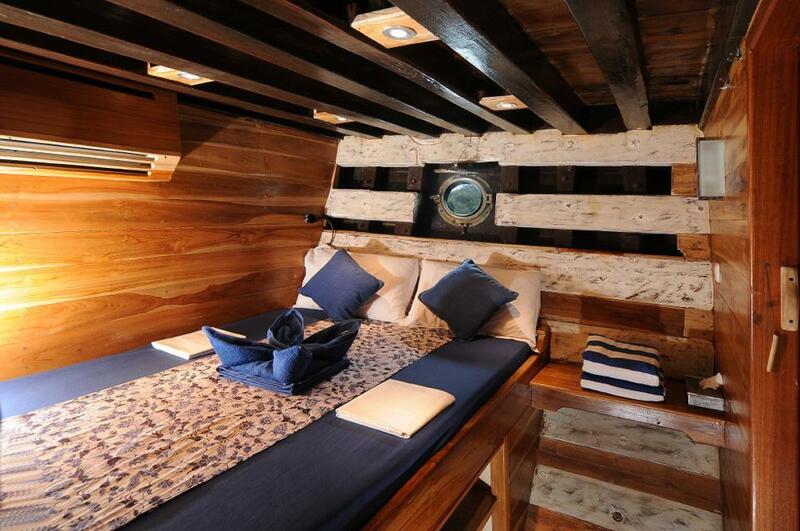 Divers who would like to stay in a cabin alone pay 75% extra. 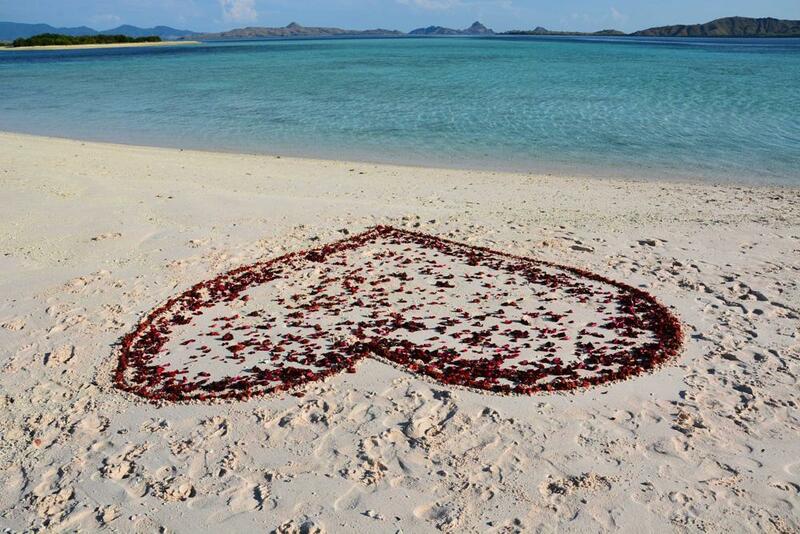 New for 2016 'Special Event': A marriage proposal, birthday, anniversary or honeymoon can be enjoyed on a pristine beach for an unbeatable rate. Please read the main text for details.